Surveying and laying out a job site is a critical first step in making sure a building’s starting point and location on a block is correct before construction begins. In short, it’s how builders ensure that what is drawn is actually built. Thankfully, the instruments to accomplish this once tedious, inefficient and inaccurate task have evolved over the past 50 years. Surveying teams that literally chalked off measurements calculated by hand can now use GPS coordinates taken by robotic instruments to perform the same task much more efficiently. 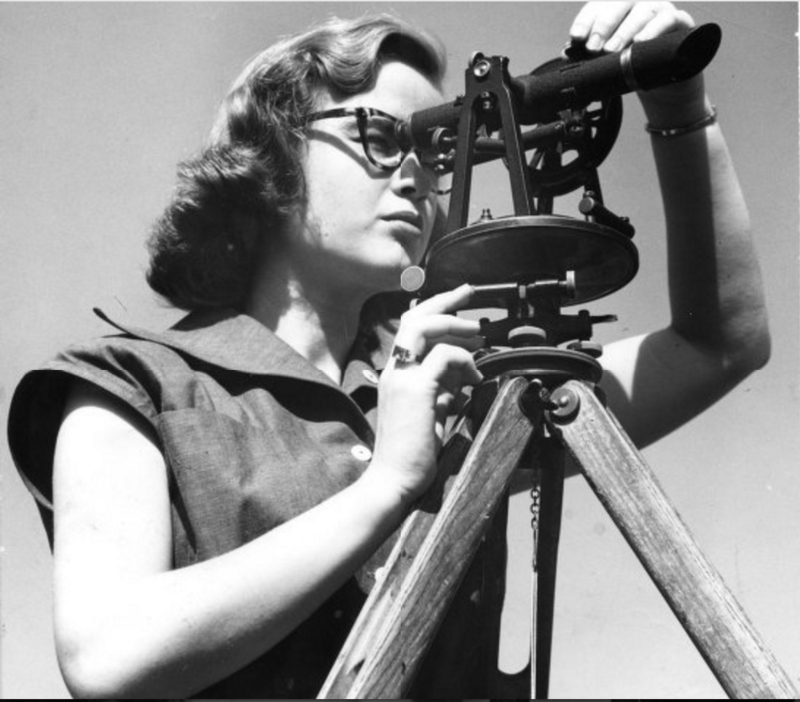 A North Carolina State University engineering student in the 1950s. Photo provided by North Carolina State University Libraries Special Collections Research Center. In the 1960s surveying crews on construction sites used two-dimensional architectural drawings to determine the “control lines,” which serve as the benchmark coordinates for all the trades to base their respective layouts off of. The lines themselves were measured by hand and marked with temporary markers, such as wooden stakes or chalk, making for a long and exhausting process that was prone to human error. Back then, it might have taken a three or four-man crew two days to layout a single floor. But it might have taken just as long to do the math to verify that the distances, angles and heights recorded by the instrument were correct. That’s right, math. Specifically, trigonometry and calculus were crucial to double-checking surveying work back then. 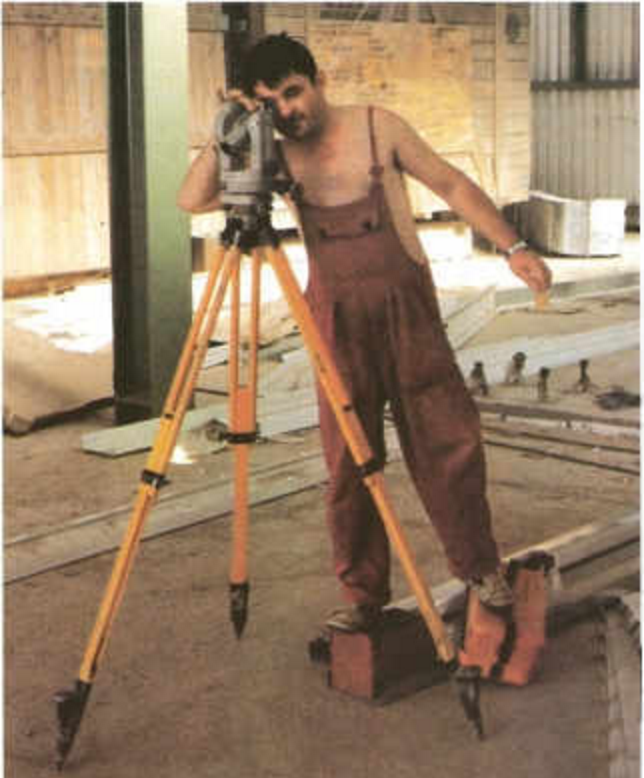 Taken in 1988, this photo features an instrument known as a theodolite. The user had to collect the measurement data from the instrument and calculate the measurements using either a field book or an antiquated data collector. Photo courtesy of Landsurveyorsunited.com. Surveying undeveloped land was equally arduous work back in the day. Justin Farrow, who runs a global network of geospatial professionals called Land Surveyors United, said it wasn’t uncommon for a five-man crew to take more than a week to survey land slotted for a subdivision. Better equipment in the 90s gave way to three-man crews: One guy behind “the gun,” another holding “the rod,” and a third wielding a machete. Yes, a machete. The guy with the gun, or an electronic optical instrument, would stand at the start of a line while another man marked the end of a line with a rod. The rod had a prism attached to the top that provided a target for the gun to take an accurate measurement. The third man used the machete to clear a path so nothing would interfere with the gun’s transmissions. Today, robotic total stations that can aim themselves automatically and be controlled remotely by a single person with a programmable handheld device have replaced these old school inefficiencies. 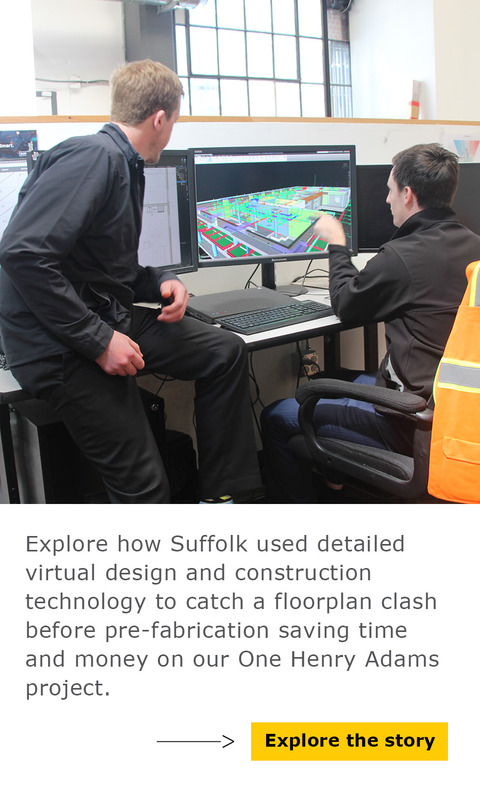 “With modern survey technology, you’re easily saving at least a couple of thousand manhours on a project,” Suffolk Senior Superintendent Mike Moore told us. Armed with GPS, robotic total stations are much more accurate than the old way of surveying. They use satellites to ping location points to the device through what’s known as an electronic theodolite. 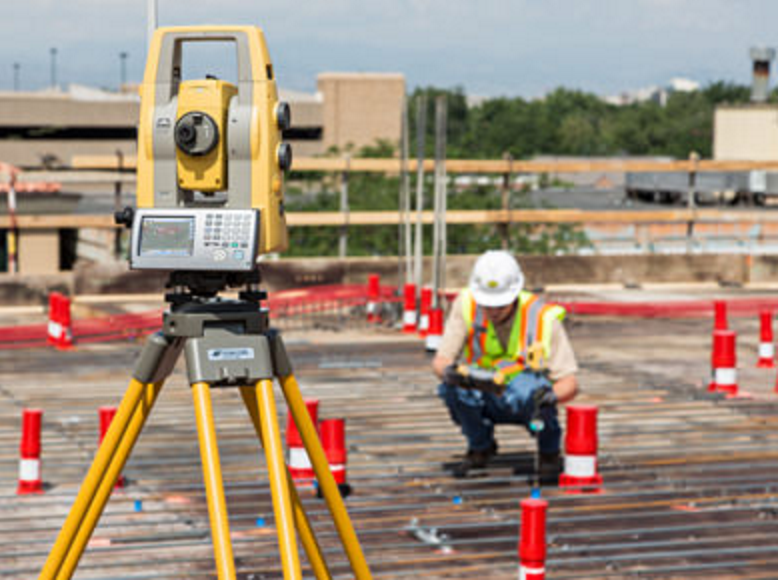 Integrated with an electronic distance meter, or EDM, the theodolite reads slope distances from the instrument to a designated point on the construction site. A construction worker using a Topcon robotic total station. Photo courtesy of Topcon. Companies such as Trimble and Topcon are on the forefront of this constantly evolving technology, and they look at it beyond just the initial site survey process. 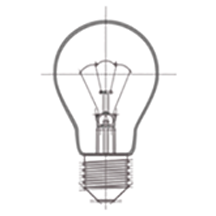 That means increasing compatibility with 3D drawings and virtual models. Robotic total stations allow project teams to use live drawings to identify control lines and make measurements so survey points are automatically built into the digital models. “The goal is to eliminate the defined divisions between design, build and operate,” Bill Stettner of Building Point Florida, a service provider for Trimble, told us. Without these modern total stations builders could never construct buildings that reflect the design so closely. And they’d have to sharpen their math skills too. This post was written by Suffolk Southeast’s Director of Marketing Rachel Elliot with input from Northeast Superintendent Mike Moore. If you have questions, Rachel can be reached at relliot@suffolk.com or follow her on Twitter at @Rachel4780.